Cold-finger measurements were used to estimate the contact resistance and average thermal conductivity of mold flux films solidified on a water-cooled copper probe. Five industrial mold fluxes, with basicities from low to high, were tested. The steady-state rate of convective heat transfer between the solid film and liquid flux was compared with calculations based on natural convection correlations; the comparison indicates that the surface of the solid film (in contact with molten flux) is approximately at its solidus temperature. The roughness of the mold flux film in contact with copper was larger for films grown from higher-temperature mold flux and for higher-basicity mold fluxes. The glassy (low-basicity) film had an estimated thermal conductivity of 1.1 W/(m K). The crystalline or partially crystalline films had higher estimated thermal conductivities of 2.2–3.2 W/(m K). The measured values of thermal resistance were extrapolated to typical mold flux film thicknesses for industrial conditions; the extrapolations confirmed that the high contact resistance of higher-basicity mold fluxes can yield higher thermal resistances than the low-basicity flux. The morphology of the rough interface of higher-basicity mold flux films that gives the higher contact resistance is consistent with that observed in previous work and appears not to be directly related to crystallization. 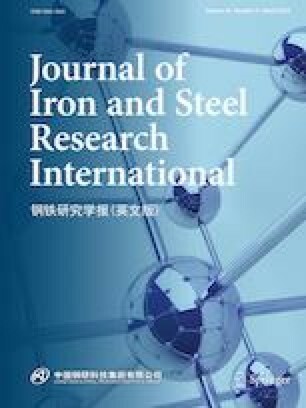 The authors thank the industrial members for their support of the Center for Iron and Steelmaking Research at Carnegie Mellon University. The authors acknowledge use of the Materials Characterization Facility at Carnegie Mellon University, supported by Grant MCF-677785.